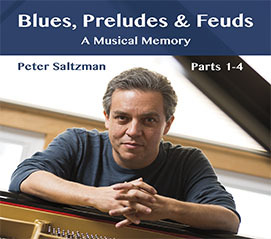 Peter Saltzman is a pianist who has written music and produced a slew of records as a solo-performer bristling with talent; a musician, who was classically-trained, seduced by Jazz and worships at the altar of originality. He has also written and performed music with the Revolution Ensemble. In many ways, everything he has done as a musician may have led up to this monumental venture. Blues, Preludes & Feuds: A Musical Memory is not simply an armchair recollection. It is a peripatetic caravanserai that journeys through a dawn of the renaissance of music during the baroque era by Bach’s majestic inventions. It is hardly surprising then that Saltzman should, in the act of playing original music such as that which is on this disc, weave Bach into cultural topography of his new inventions. However, Bach’s Preludes, Fugues and a Two-Part Invention are not the only aspects of the baroque that inform the endless creativity on this album. The shadowy figure of Thelonious Monk and a floating bust of Beethoven suggest that there is much more to this musical pursuit of a musical Holy Grail. However, as in the case of the search for the fabled chalice, Peter Saltzman’s musical journey is interminable. This is cleverly suggested by the short, jabbing lines in Fanatical in A, for instance; or in the palpable deeply-felt sighs that inform the music of Temporary Cessation of Hostilities as it transitions to Amazing Grace. The “Blues” and “Feud” parts of the music are born of Saltzman’s artistically militant side. Raised in the harsh political climate of 1960s Chicago, Peter Saltzman would naturally be affected by the fiery winds that seared the more deadly aspects of the windy city into the memory. But the often whimsical and angular phrasing of Saltzman’s music played in deference to Monk is what finally defines this extraordinary musical tale that is available as a hybrid music-eBook; another Peter Saltzman sleight-of-hand to marvel at. Love this review! Very thoughtful and informed. Thanks, Raul.